I'm going home today. 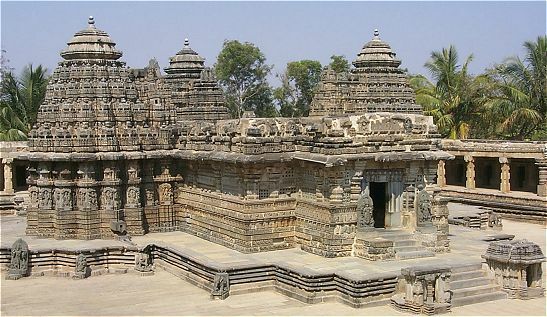 Leaving at 10 AM this morning, we're going to visit Somnathpur Temple, an ancient complex on the way to Bangalore. That will be my sole sightseeing this time as we've been working most of the time. Mysore is a wonderful city in the conservative south of India, people are still very much traditional. It's not quite easy to reach as the 140 km takes about 3,5 hours without traffic. I've been told that they are building a new 8 lane highway from Bangalore to Mysore and the airport will be converted in an international airport in the next few years. If anyone wants to see traditional India 'in the wild' this city is recommended. Edited 1 time(s). Last edit at 02/27/2008 08:27PM by tliet. This will probably mean that the area will change for good and not for the better. So, do it in the next few years while travelling to here is still mildly inconvenient. Edited 1 time(s). Last edit at 02/27/2008 08:33PM by tliet. I hope one day to have the chance to visit India. Sounds great. Funny, one of my Deutsche podcasts is about the WHO TB report today. I was asked today my a movie producer friend of mine if I was interested in spending 6 months in Japan for a movie shoot. Damn, that's tempting. I'm not having any fun at work lately. But that might be a bit disruptive on the kids. only if they pick up the tab, or you'll go broke. I was going to warn you about all the monsters, but since Cloverfied we have our own. Damn Tagruato Corp. anyway. Oh, yeah. They'd be hiring me and paying for everything. Do it. You only live once. Make sure to constantly wear a rising sun headband. This morning I tried to check the Indian Railroads website for a train from Bangalore to Mysore. Man, I love this country. Check the screenshots. Edit; the online reservation form is also a classic. Edited 1 time(s). Last edit at 03/25/2008 07:05AM by tliet. What are you doing there, again? Yes, I'm afraid I've got to go again. I work from home the last couple of months (no point in going to work when you're on the phone and Skype the whole day) it's really hard to get things to wrap up over such a long distance. This project that I'm on is a show piece of how long distance projects don't really work. I've done magical things with 4 guys in a room but when you spread these people out over a long distance, things come to a standstill. Gee that makes me really want to hire some Indian programmers. Taking the redeye to Boston tonight, through Saturday, to case the joint. Would've been awesome if the Sox were playing at Fenway (I'm staying in a hostel nearby). Gonna be a 40-degree difference. Edited 1 time(s). Last edit at 03/26/2008 06:58PM by johnny k.
This is about the time of year I start to miss Boston/Cambridge again. During the winter, I'm very happy not to be there. I'm off to Chiang Mai, Thailand, at the end of May for my brother's wedding (he lives there). Aside from a one-night stayover in Montreal, I haven't been out of the country since my oldest was born in 2001. I guess if I'm going to go away, I might as well really go away. One night in Chiang Mai, and the world's your oyster.